John Rich (born in Amarillo, Texas on January 7, 1974) is a member of the country music duo Big & Rich. Rich graduated in Dickson County, Tennessee and after graduation moved to Nashville where he worked at Opryland USA singing. Not long after he met up with the group Texasee. After hundreds of shows the band changed it's name to Lonestar. While in Lonestar, Rich was the bassist and, on some occasions, the lead singer (one of the band's singles, "Heartbroke Every Day," featured his lead vocals). In January 1998 Lonestar annouced on their web site that Rich was leaving the band to pursue a solo career. To this day, it is widely speculated that Rich was fired for what is known as his undesirable cocky attitude. After this, Rich became a solo artist with BNA Records, but his albums were never released. In 2006, after forming Big & Rich, "Underneath the Same Moon" was finally released. When Lonestar's "Come Cryin To Me" went to #1 in 1997, John became the youngest songwriter to have a #1 song. 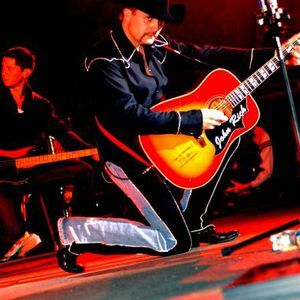 John Rich is also a notable songwriter, having written 900+ songs to date, many of which have been recored by Faith Hill, Jason Aldean, Gretchen Wilson, Cowboy Troy, Keith Anderson and many more.